Private, 740351, 2 Platoon, A Company, 1/25th London Regiment. 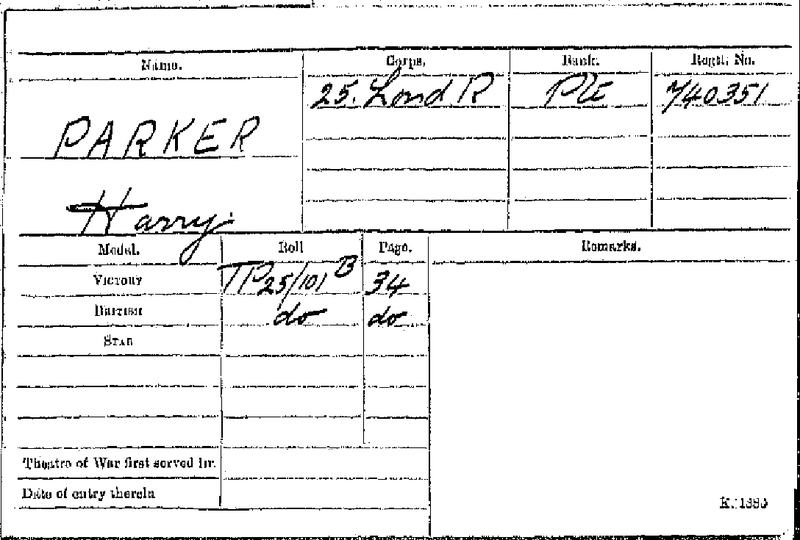 Harry Parker was born in Chertsey, Surrey in 1895. His father, Percy John Parker, trained as a Railway Carriage Body Builder at Eastleigh in Hampshire, and initially worked for the London South West Railway. Shortly after the turn of the century his father took up a position in India with the Bombay, Baroda & Central India Railway - Parel Works. However this move was not a great success. Harry's mother Amelia suffered smallpox, and two children born in India died in infancy. As a result Harry's mother returned to England with the three surviving children, who were all born in England prior to India. Harry's father stayed on in India to work, and presumably save money. However he died there in 1911 of Typhoid, so the family never saw him again. He was buried in the Sewri cemetery in Bombay. When Harry joined the 25th London Cycle Regiment, he probably never envisaged that it would take him back to India in 1916 as it did. No doubt he visited his father's grave during his stay, especially as he was based at Poona in 1919, not far from Bombay, as the family have photos of his father's grave. The 1/25th participated in the Afghanistan campaign of 1919 before returning to England. However it appears Harry did not, as his medal card does not include the India General Service Medal for the NWF campaign. This was because he became a clerk in the regiment from 7 Dec 1918 to Sept 1919, at the M.A. Depot, Poona [certificate of service details]. He is pictured in a photo of the Field Revision Office in Poona dated 1919. How many of the 1/25th went to Afghanistan in 1919 is not known at this stage of research. Harry took a number of photos during his service in the 1/25th [see photo album]. This album is still in the family and contains just over 200 photos, most of which appear on this website. It can be seen from the photo album that the regiment travelled widely in greater India as it was then, from Bangalore in the south, Bombay & Poona in the West, the North West Frontier, and Simla, the British summer administration centre in the Himalayan foothills. In 1963, forty four years later, his son Harry jnr., decided that the best way to travel from England to Australia was by bicycle. This journey took him through Pakistan & India. A few years later Harry jnr. drove back to England from Australia in a landrover. He visited his grandfather Percy's grave, but said "the grave was a chook run for squatters". This made three generations of the family that, through varied circumstances, had temporary stays in the sub continent. Seems almost serendipidous.